I couldn't believe my eyes. We were standing above the people with a huge old Bible on my left. 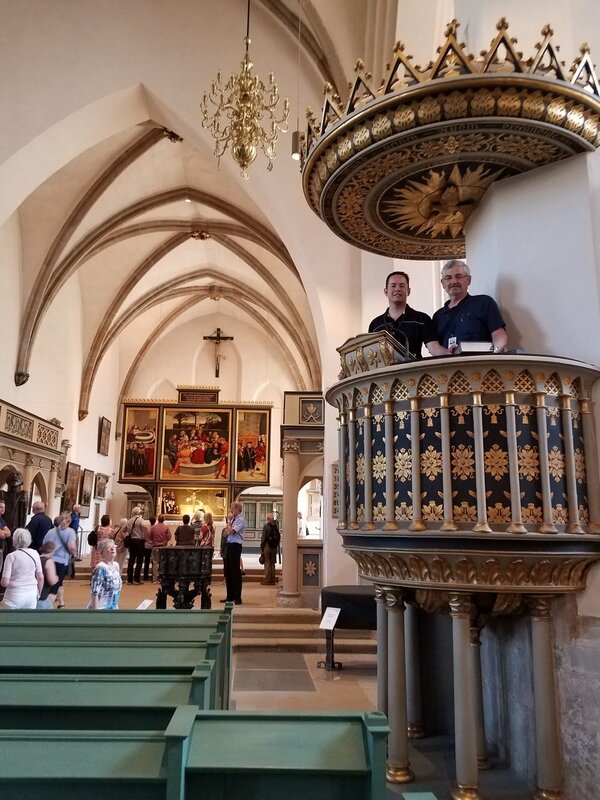 Chris and I were standing in the actual pulpit the great reformer Martin Luther. This picture was taken in Luther's Saint Mary's church in Wittenberg, Germany where he had been a Catholic priest prior to 1517. We were there for the conference celebrating the 500th anniversary of the Protestant Reformation (1517 to 2017). After Luther became a believer by faith alone in Christ alone he continued in this church. It was his study of Romans 1:17; "The righteous man shall live by faith." that changed him. Prior to that he had strived to please God by human works and merit but knew he always fell short. Then he saw Scripture taught that forgiveness is by faith alone in Christ. He went from a man that was a mess, confused, fearful and feeling demon oppressed to one that was changed. He was changed by God and became a man of simple faith and was passionate about preaching the Bible as God's only authority. His church eventually changed also from Catholic to protestant. We were standing in it. While touring we asked if Chris and I, being pastors, could just go up and stand in Luther's pulpit. The lady in charge looked perplexed but then agreed and led us to the narrow spiral staircase and opened the gate. We climbed the ancient wooden steps and stood where Luther preached over 1,000 sermons that changed the world. This was the place where a man was used of God to bring about perhaps one of the greatest movements in the last 2,000 years. Amazing! There was a huge bible there so I put my hand on it for the picture that the wives below took. This reminded me of the first reformation principle called "Sola Scriptura" or "By Scripture Alone." There is no other authority God has given on earth determining doctrine or practice of spiritual things than Scripture. The Bible is it. Luther stood on that principal. Not church tradition or sacraments, not human leaders or popes, not additional books like the Apocrypha nor dreams or visions. The sufficiency of Scripture is it. That is why we preach verse by verse. Note also the elevation of the pulpit was so the preacher could be seen and better understood. The rounded roof-like cover above acted as a sounding board so the preaching of the Word could be heard. The preaching of the Word of God became central and replaced the Catholic view of communion and baptism as "sacraments" that somehow dispensed grace or forgiveness rather than simple remembrances or symbols of truth. Eventually the pulpit location also changed from being placed on the side to the center of the church as we have it today indicating Sola Scriptura. I wonder what we find in the pulpits of today? It is easy for pastors to capitulate on solid preaching and replace it with catchy sermons, interesting stories, humor, shorter sermons and even drama. This results in more and more people being less and less literate about the Bible even though attending church often. Many who claim to be Christians today have little knowledge of God's Word or even attend church. Studies show this is increasing among millennials. This results inversely in more spiritual and moral problem and people being led by their emotions or subjective feelings. The application of Sola Scriptura (By Scripture Alone) for today is that we must first read it and then study it to know God and what he desires of us. How is your Biblical literacy? The 95 theses of Luther have been rewritten to make them clearer for our generation today. They are called "For the Love of Truth" after Luther's preface to the original 95. Here is one for Sola Scriptura. "Because the Scripture is all-sufficient to know Christ and believe in Him, we reject the belief that God will bring about salvation in Christ through the sacraments, visions, or dreams." This means se must also preach it, teach it, believe it and live it today. Like Luther, we should say, "Here I stand (on Scripture), I can do no other." May the Bible continue to be heard in clarity today in pulpits and lived in our homes. We had the opportunity to preach that Word yesterday from a different pulpit in the small church in the Ukrainian village of Makarovo. It was such a blessing to reunite in worship and encourage them. They send their greetings to us. More later. Chris preaches the Word as Caleb translates. Village ladies Natasha, Anna and Pasha chat with my daughter Ruth and granddaughter Naomi.